The exhibition opened its doors to the public on April 18th, in the week running up to Record Store Day, to showcase the one-off vinyl sleeve designs by a multitude of artistic and musical contributors, including the designers of some of the most iconic album artwork of the past 20 years. The design challenge was originally set last year by a team from Universal Music UK and Teenage Cancer Trust, who offered the choice of seven different singles for which to create a sleeve. The tracks selected to inspire the art were: The Cure’s Friday I’m In Love [released again for its 20th anniversary] Noah & The Whale’s Old Joy, Florence + The Machine’s Only If For A Night, Ben Howard’s Black Flies, DJ Shadow’s Come On Riding (Through The Cosmos), CSS’s City Grrrl and Bombay Bicycle Club’s Lights Out, Words Gone (special Dub mix). When the resulting sleeves go on sale in Shoreditch, no-one will know who designed each one, or indeed which track is inside – putting the secret in Secret 7”. Half of the sleeves were designed by creatives from around the world and submitted via the Talenthouse website earlier this year, a process which helped highlight the importance of the work of Teenage Cancer Trust. One young designer used her Secret 7” to immortalise her late best friend who tragically passed away from a rare form of cancer aged just 20 . Each of the seven musicians and groups who provided the tracks handpicked their 45 favourite Talenthouse sleeves to go into the show. The remainder of the sleeves have been designed by some of the most interesting and exciting artists working today. To name just a few: David Shrigley, Michael Spencer Jones (Oasis, Verve), Central Station (Happy Mondays, Black Grape), Toby Mott (De La Soul), Stylorouge (Blur, The Cure, Morrissey), Richard Evans (The Who) and Grammy winner Peter Corriston (The Rolling Stones, Billy Idol, Carole King, Debbie Harry, Led Zeppelin, New York Dolls and Tom Waits). 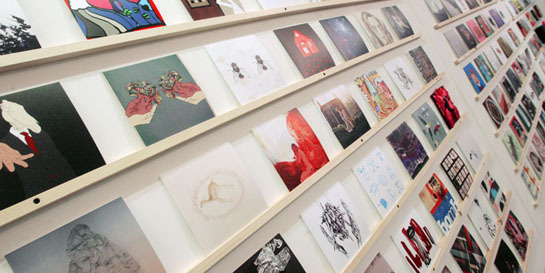 Contemporary illustrators and artists, as well as youngsters who receive support from TCT, make up the remainder of the creative team supplying the completely unique sleeves.